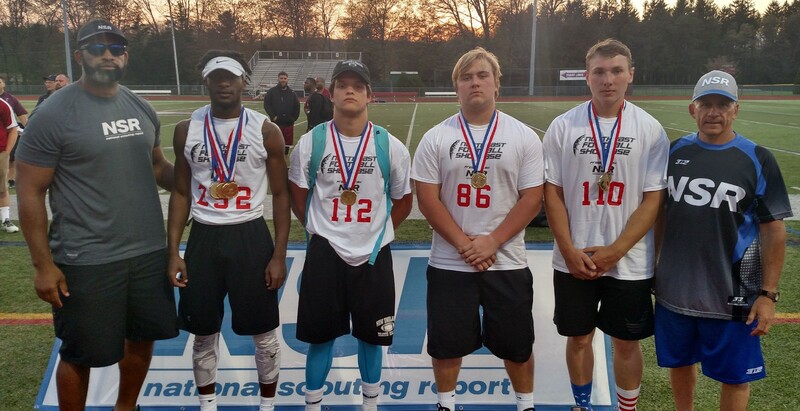 The Northeast Football Showcase event provides players with the ability to be evaluated by college coaches while at the same time being professionally filmed. This is an extensive skills and drills video showcase. We will have you execute all of the individual skills and some team skills. This is a great opportunity to have your individual skills video done and work-out in front of college coaches. Additionally, each college coach will receive your academic profile, athletic stats and contact info. Entry Fee: $140 per player. Five (5) or more players from one school = $99 per player. 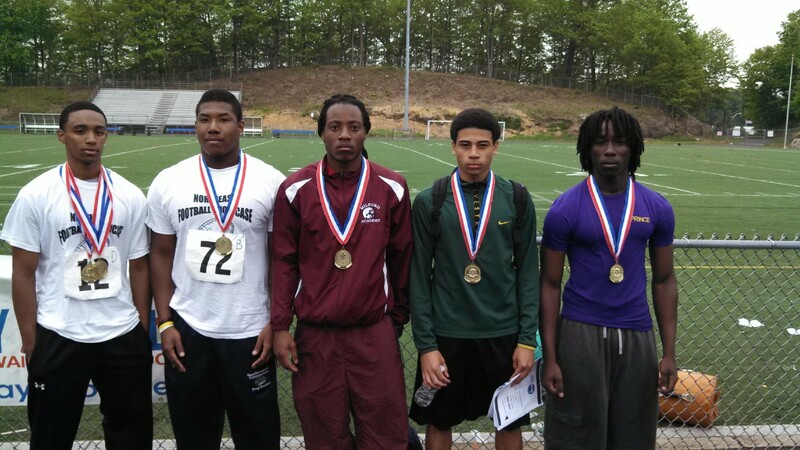 ​To receive the Discount you must first contact our office at 860 788 7041 to provide the names of the 5 student-athletes and the school they attend. To provide a Top Level opportunity for high school football players in the Northeast to display their athletic skills and gain objective personal test scores in order to allow each player to further their academic and athletic careers. Players are also able to showcase their skills and talents in position-specific drills and 1-on-1's. Each year, 60 Plus Coaches from Division II, Division III, NAIA Colleges, Prep School and Scouting Services attended the Northeast Football Showcase. This is a great opportunity to have your individual skills video done and work-out in front of college coaches. Additionally, each college coach will receive your academic and athletic profile and contact info. 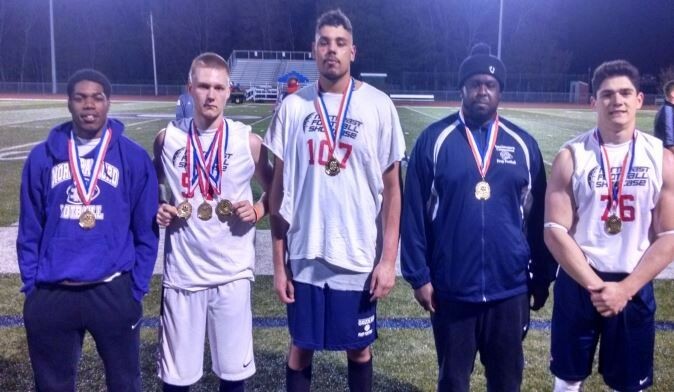 Each year, over Fifty (50) Division II, Division III, NAIA College Coaches, Prep School Coaches and Recruiting Services attended the Northeast Football Showcase. The list below will be continually updated as coaches register to attend the Northeast Football Showcase. In 2018, the following Colleges and Universities attended the 9th Annual Northeast Football Showcase. 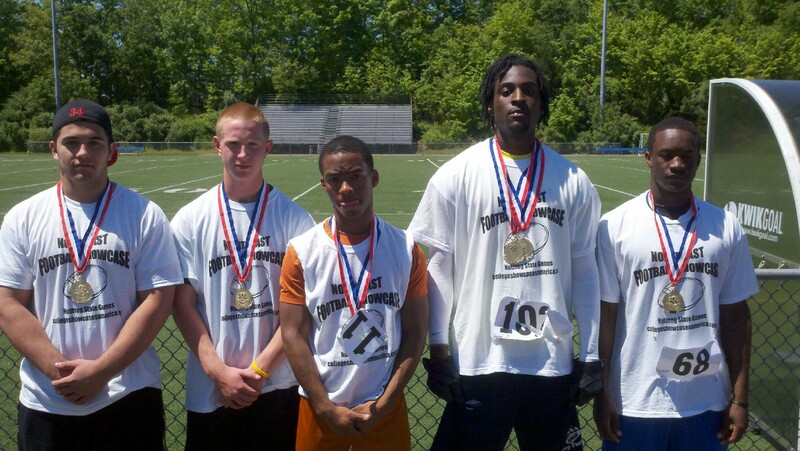 UMass Dartmouth has been attending the Northeast Footbal Showcase since 2013. Each year we have signed at least One Player from this event. In 2017, we signed 5 players. The 2018 showcase was absolutely great and very well done as it is every year. Hands down one of the best Showcases in the Northeast. 2:35 PM - 4:25 PM - 40 Yd Dash, Bench Press, Vertical Jump, Standing Jump, Pro-Agility Shuttle, 3-Cone Drill. 4:30 PM - 4:55 PM - Quarterbacks, Running Backs, Tight Ends, Receivers, O-Line. NCAA Information on Recruiting—Parents and athletes will learn about the recruiting process from the experts. 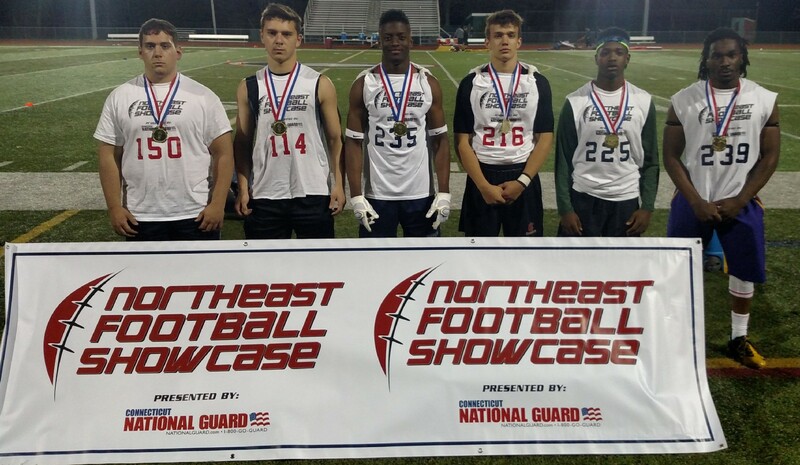 The Northeast Football Showcase is an extensive skills and drills video combine. We will have you execute all of the individual skills and some team skills. There will be no games just skills footage. This is a great opportunity to receive your individual skills video and work-out in front of college and prep school coaches. All participants that registered online need to complete this form. Players that filled out a hardcopy form do not! Cleats (molded) and Running Shoes. No pads will be needed. A tremendous attitude with the eagerness to perform at the maximum level! Are you a football player looking to reach the next level? It takes more than just your talent. You can be an amazing football player with eye-popping skills but if the recruiters out there don't see you, there's no chance. Recruiters, coaches and managers all want the same thing - video evidence of your greatness. Memory to Video Productions combines a unique eye for the action with broadcast-quality camera equipment to produce compelling highlight reels that impress those recruiters. Coaches are anxious to learn how an athlete makes decisions, as well as how athletically gifted he may be. We capture the action and emphasize the most impressive aspects of any athlete’s skill-set. All highlight reels are built to your specifications. We’ll produce rough drafts of YOUR highlight reel for you to view and then make decisions as to how you’ll want to see YOUR finished product. We’ll work closely with you to ensure that your highlight reel tells the story you need it to tell. Because of this individual attention, each highlight reel - whether it's football or any other sport - can vary from how information is displayed to how long it plays to the audio that is included. Contact us for a free consultation with a former ESPN professional and get started today! Learn more about us at www.memorytovideo.com. Parisi Speed School - Official Training Partner of the "Games"! Parisi Speed School (Bristol & Enfield) is the Official Training Partner of the Nutmeg State Games! With over 75 locations nationwide, the Parisi Speed School is recognized as the country's premiere athletic performance enhancement organization for youth athletics. Using techniques that have produced over 190 NFL draft picks, our specially trained performance coaches deliver a positive training experience that improves speed of movement and strength in character regardless of ability or economic status. Whether training individual athletes or entire teams, athletes see clear results in performance and self-confidence from our programs. Call us today for more information and a free introductory class. 40 Yd Dash: 4.59 Seconds. #16. Terrance Bogan, Sheehan HS (CT). 9'8". #28. Joe Dumoulin, Holyoke HS (CT). 9'8". #66. Devario Ried, Wilcox Tech HS (CT). 33 inches: #66 Devario Ried. Wilcox Tech HS (CT). Pro Agility Shuttle: 4.19 Seconds. #52. Trevor Sterry. Brookfield HS (CT). 4.58 Seconds. #252. Christopher Woodard, Patterson HS (NJ). 10 ft - 2 inches. #252. Christopher Woodard, Patterson HS (NJ). 36 inches. #252. Christopher Woodard, Patterson HS (NJ). 4.21 Seconds. Zachary Pollicino. Smithtown West High School (NY). Geoffrey Kirk (Avon HS) - 9' 11"
Andrew Blackmore (Avon HS) - 31.5"
Standing Jump: Vernon McAlmont - 10' 4"
Devante Tee - 10' 6 1/2"
Marc Desruisseaux - 10' 6 1/2"
To receive the Discount you must first contact our office at 860 788 7041 to provide the names of the 5 student-athletes and the school they attend.